The Acropak® Reel-Less Packaging System eliminates costs by eliminating the reels. 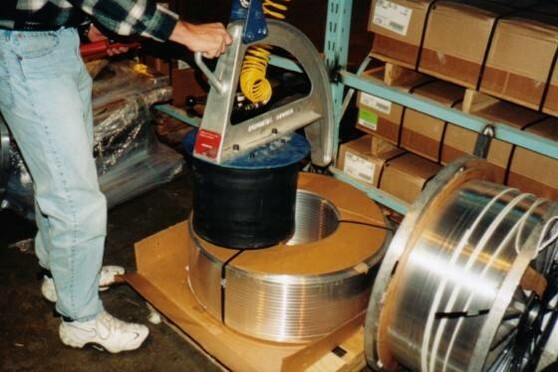 Our demountable spools allow producers and processors to send or receive wire, or other normally spooled materials, bundled without reels.There is no need to maintain adequate reel inventory or to account for reel shipment and return when utilizing the Reel-Less Packaging System. 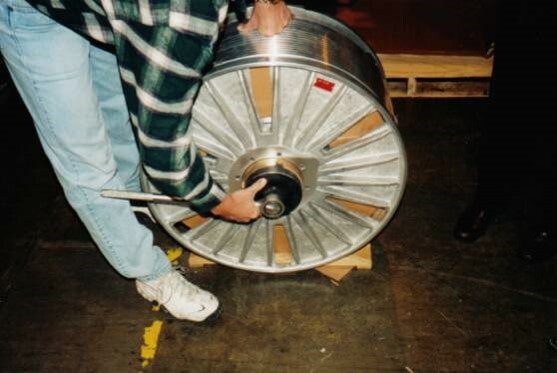 For the Manufacturer: The Acropak Reel-Less Packaging System uses a demountable collapsing reel for product spooling, which is removed after take-up and prior to shipment. As a result of reduced handling costs, you can be more competitive in the marketplace. In May of 2015, Aitkin Machine & Manufacturing took over as full supplier of the AcroPak product line. The AcroPak line was formerly supplied and assembled by esteemed metal technologies company, Atek in Brainerd, MN. Prior to May of 2015, AMM was one of the main production companies for multiple components of the AcroPak line. We are now your main source for the demountable reel system! Please contact us today for more information or a quote! Please contact Travis Leiviska with AMM at (218) 927-5600 for inquires. Pneumatic Lifter/Tilter: Acropak Pneumatic lifter / tilters are designed with people in mind. Much like filling a tire, the inflatable air bag exerts gripping pressure against the inside of the coil. Units include air bag, air controls, and a quadrant / trolley mechanism for easy shifting between vertical and horizontal positions. Hand Wrenches: Hand wrenches are designed to assist with the removal of reel flanges – making the job quicker and easier. Impact Wrench: The impact wrench solution makes the removal of the nut faster and easier. Our adaptors are specifically made to fit the large nut on your Acropak Reel-Less Packaging System.